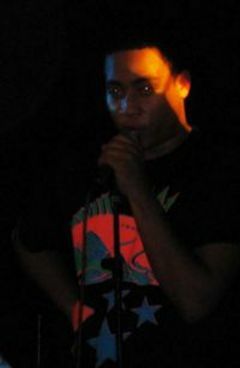 After the powerhouse album that was Breaking Kayfabe, Canadian MC Rollie Pemberton aka Cadence Weapon is set to release the follow-up early next year. So in anticipation we thought we'd catch him at this intimate venue for a few reasons. Firstly, his debut was so electrifying I was intrigued how it would translate live and secondly, the gig was in a pub round the corner from our South London Division and we'd probable be drinking in there anyway. Well, it was worth the 5 minutes walk. For the first few songs things looked like they were going from bad to worse as the crowd was slow to warm to this full-on assault of electro beats and intricate wordplay. But the sheer exuberance of Pemberton soon stopped the tongues wagging at the back and he had us in the palm of his hand. Big hitters like Sharks and Black Hand from the debut came out at full force with Pemberton carrying himself more like a rock star, wielding his mic stand and shrieking into his fist. But it was cuts from the forthcoming Afterparty Babies that really rocked the house. His DJ was often allowed to take centre stage with his expert beat skills and the near-house beats that blasted out had the whole place bumping to his every move. With frequent spells into the centre of the crowd, this young MC was captivating to watch so much so that he was cheered back on stage for an encore where he delivered the awesome Oliver Square. His energy was unfailing and though I could have done with a bit more volume on his mic his blend of hard-as-hell electro beats and fierce yet acutely intelligent lyrics, not to mention a surprising cover of Joy Division's Isolation which made this Friday night in the pub a memorable one.